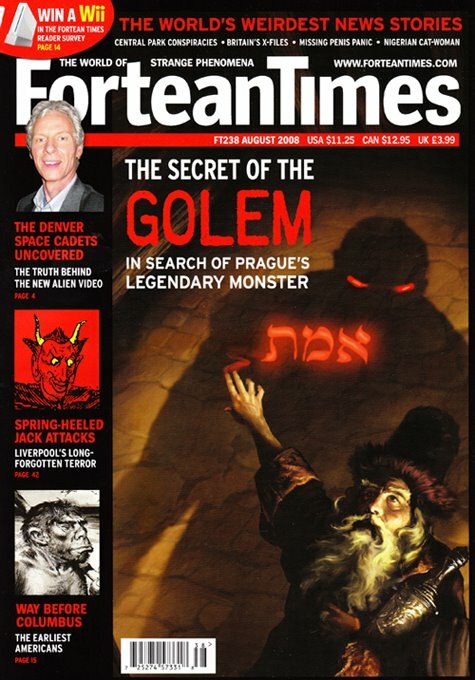 The August 2008 issue (#238) of the British Fortean Times magazine carries a fascinating and significant article about the Golem of Prague, meticulously researched by Ivan Mackerle. 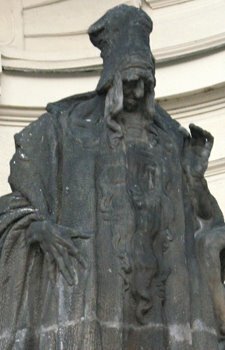 The legend tells of Rabbi Loew of Prague, in the late 1500s, who fashioned a powerful Golem to protect the Jewish community from its enemies. One day, the creature ran amuck, bringing death and destruction to the ghetto. Deactivated, the Golem was hidden away in the attic of the Old-New Synagogue, the stairs to the storeroom removed and access thereafter forbidden. Tracing the origins of the legend and a possible basis in historical fact proves problematic. According to ancient lore, Golems were never built as warriors. They were meant as a test of sorts, an experiment to measure the abilities of their Kabbalist creators. The Talmud names five Rabbis who made Golems, but Rabbi Loew is not among them. Golems were animated with magical words carved into their foreheads or worn around their necks, but Rabbi Loew animates his Golem in a very unusual manner, inserting a slip of magical parchment into its mouth. Key characters and locations in the story cannot be found in historical documents, and there is no record of the pogrom that would have motivated the creation of a protector Golem. Most tellingly, it seems that Rabbi Loew himself cannot be placed in Prague on the crucial dates in the legend. Closer examination of the tale reveals a creature that behaved rather un-Golemlike, a “strangely down-to-earth” creature, as Mackerle puts it. Golems quickly grow in size until they become unmanageable, but this one lived quietly for twelve years, performing simple household tasks. He even had a human name, Yossele. Here Mackerle formulates an interesting hypothesis that, given the lack of historical evidence to support the legend, could explain Rabbi Loew’s unusual Golem. Mackerle’s purpose is to demonstrate that something, somehow, could have inspired the legend. Imagine, then, a man who suffered from a form of mental illness, taken in and cared for by the kindly Rabbi. He suffers from occasional fits, perhaps an epileptic condition. The legend’s parchment inserted in the mouth could suggest medicine taken orally, or the practice of placing of a rag in the mouth during a seizure. Ultimately, the man suffers a violent and very public attack of some sort, a burst of uncontrolled anger, and dies. In the end, the event is hushed up, “to avoid unpleasant consequences for the rabbi and the ghetto”, and the body of the strange man is relegated to the attic. Whatever inspired the tale of the Prague Golem, the story of its purported resting place in the Old-New Synagogue’s attic has yielded numerous stories of death, or madness and otherwise horrified reactions for its rare visitors. Well warned, and armed with ultrasound equipment and the permits that took two years to obtain, author Mackerle concludes his investigation by climbing the iron rungs to the building’s roof and its forbidden storage space. Unless the Golem has been long removed — and there are many claims to that effect — or it has crumbled into dust, of which there is plenty packed into drifts among the rafters, the Old-New Synagogue’s attic proves barren of monsters or new clues. Ivan Mackerle’s article is like a supernatural detective story, intelligently written and packed with details. It’s a wonderful read, a valuable document of Golem lore, and well worth seeking out. A sidebar article by David Sutton chronicles the Golem in culture, touching on the claim that Mary Shelley was inspired by the old legend. There is no evidence of this, but there is no doubt that the Golem movies of Paul Wegener had some degree of influence on James Whale and the writers and designers of the Universal studio’s Frankenstein of 1931. The beautiful cover painting is by Owen Richardson. Also pictured: A statue of Rabbi Loew in Prague, and Paul Wegener as The Golem (1920). Note the Frankensteinian "asphalt spreader's" boots. Great stuff, Pierre - thanks for the headsup. And thanks Ivan, for the "what if?" theory; if the whole thing wasn't just a teaching fiction, this theory makes sense. Thanks for this post. It definitely inspires me to look further in to the Golem legend, especially because of the intriguing connection with Frankenstein's monster. Also, I think my school library has a silent film of Golem. I will have to check that out. Craig, Chad, I urge you to hunt down that issue of Fortean Times (still available in North America). Mackerle’s article is full of fascinating details. Rob: That Golem reference about Lugosi’s test reel appearance is very suspect. It is from a quote attributed to Edward Van Sloan (operative word: Attributed), reported by a teenager without journalistic experience, and published by Forry Ackerman, who may have punched up Van Sloan’s description. What’s more, if a Golem reference was made, it could describe a clay-like finish to the makeup (which could be said of any heavy makeup including the Frankenstein Monster’s) and not necessarily a supersized pumpkin head wig. One must also note that Robert Florey, who originally developed the project, and rehearsed and directed the infamous footage over 3 days in June 1931, later wrote that Lugosi wore the same makeup as Karloff. I plan on doing a post at some point about this controversy, with all the exact quotes and statements, but the solution to the mystery, as you suggested, would be finding the lost test, or at least some stills. And while we’re at it, I wouldn’t mind seeing a copy of the Italian Monstro di Frankenstein, or Bela Lugosi’s speaking scenes from Frankenstein Meets The Wolfman. I've always hoped that filmmakers dealing with the Frankenstein myth would find creative ways to reference his kindred spirit The Golem. The closest I've seen is the delightfully campy graphic novel "Billy the Kid's Old Timey Oddities" The Kid travels with a group of circus freaks to Transylvania to fight Dr. Frankenstein (who looks just like Peter Cushing). Once there, they fight an assortment of Golem creatures that the evil doctor has created, having given up his experiments with dead tissue and now trying more organic methods. It's a great read. The Rabbi Loewe Golem story seems to have only surfaced two centuries after his death. For any number of reasons, Golem-lore seems to be a lot more popular among the public in the 20th-21st centuries than it ever had been amongst Orthodox Jews of any period. And has anyone seen the videocassette that tries to simulate the Lugosi screen test by superimposing Wegener's Golem wig over a still of Bela in FRANKENSTEIN MEETS THE WOLF MAN?